This is Bella's Place. Robert and I are so happy with the way it turned out. For some time we were racking our brains...where will we put Bella? What will we do with this baby? We have to move! We have to move now! So the plan was to move in May. Then I kept hearing in my head.."Work with what you've got. Don't long for something more, or better, or bigger, make the best of what you have." I thought to myself, if we move in May, that will be probably a month or so of packing, moving, and unpacking. All so a child that can fit in my arm could have her own room. It sounds foolish as I write it. To miss a whole month of her infant life being distracted by boxes and paint and disarray.....for what? 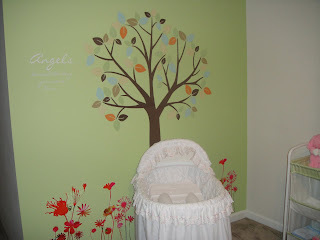 So I can feel better about the fact that this little peanut would have a 'nursery'? Nah. Never mind. The plans got squashed. We will move when the time is right for our entire family. Not so we can say....look at our new place that's a perfect size for all of us. That's not what matters. 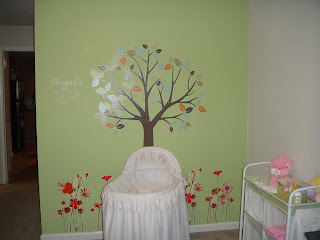 So we decided to make a beautiful space in our room for Bella. I Painted the wall, and Robert put up all of the wall art. The bassinet you see, I put my first born child in to sleep every night almost 12 years ago. Then my sister put her now 10 year old baby girl in it every night to sleep as well. Now it's Bella's turn. She will come home in the same hand knit sweater that Amber came home in from the hospital back in May of 1998. Those are the things that are important. Those are the memories that we would like to make for our daughter. Not to mention, it came out absolutely beautiful! Colleen it is so sweet! I love the traditions you are passing on from your family! I can't wait to see her!! I love it - it's beautiful!!! What an amazing woman you are....a wonderful perspective for what is important. Love you! How PRETTY!!! You and Robert did an amazing job. The most important thing is that Bella is surrounded by love, not space. How awesome that you guys get that...wish we could say the same about all parents. May God continue to bless you all!!! Colleen, it came out beautiful! 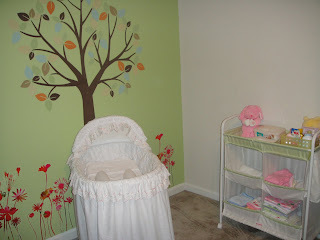 What an adorable little space for your new little princess. 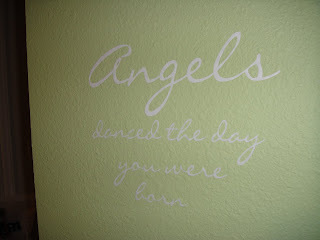 I love that Angel's quote you have. Bella is one lucky baby girl. Bella's space is beautiful. I love the trees and the colors. Bella is going to be so loved. You guys are so blessed. I can't wait to meet her. Only a few more days!